On Thursday evening the staff of the city corporation arrived to remove the illegal shed which is said to be constructed on a road at Hindwadi just opposite Gomatesh Viydapeeth. MLA who had already got the news of the arrival was present at the site and said why is that the Corporation is behind him and not looking at the hundreds of other encroachments in the city. Commissioner Sashidhar Kurer said that he was here as per the orders of the court and he had to vace this land. 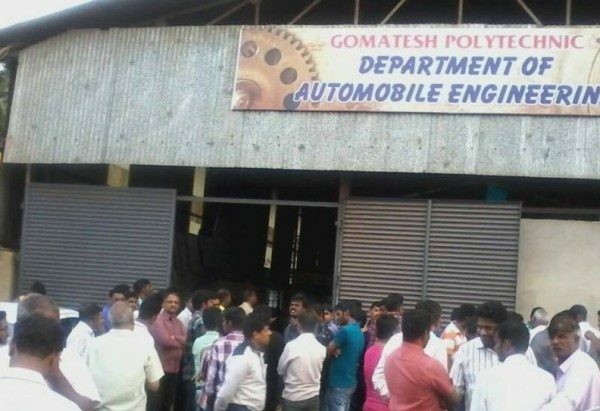 To this MLA Sanjay Patil requested that he be granted 10 days to shift all the machinery inside the shed which a automobile workshop. Heeding to the MLA’s request Kurer has given the MLA 10 days to remove this shed which is encroached. There were hundreds of people who had gathered to see and they were saying why is that he was granted 10 days when otherwise the Corporation had demolished houses even with out notices. The MLA has been granted 10 days but will the corporation come back after 10 days to remove the shed is the biggest Question now and only time will answer it. Any developments on this yet ??? Each and every encroachments in the city have to be removed and corporation as to plan well for better roads and parking. Which they are not doing anything. Very sad. It has been done early, already late. I don’t know why they have given ten days. OK fine however our MLA ready to remove encroachment it’s appreciable. What about Khanapur road, finish it fast.